As an NFL cornerback in pass coverage, if targeted by today’s pass-happy offenses – your job is to force incompletions and collect interceptions. By doing so, you hurt the opposing quarterback’s passer rating, with the ultimate goal of getting the opposing offense off the field. PFF’s passer rating when targeted signature stat gives great vindication of who indeed are arguably the league’s best cover corners in a given season. 39.6 is the number a quarterback receives for simply throwing an incompletion, so anything under that mark when targeting one cornerback is truly incredible, especially after 14 weeks of the NFL season. *Editor’s Note: This data was pulled prior to the Thursday Night Football game between Denver and Indianapolis, and thus all stats reflect up to the culmination of Week 14 of the NFL season. This past offseason, Bouye signed a lucrative deal with Jacksonville after a breakout season in Houston. He’s been worth every penny to this point as he ranks tied for fourth in coverage grade (90.9) among cornerbacks, which includes a cornerback-leading six interceptions. 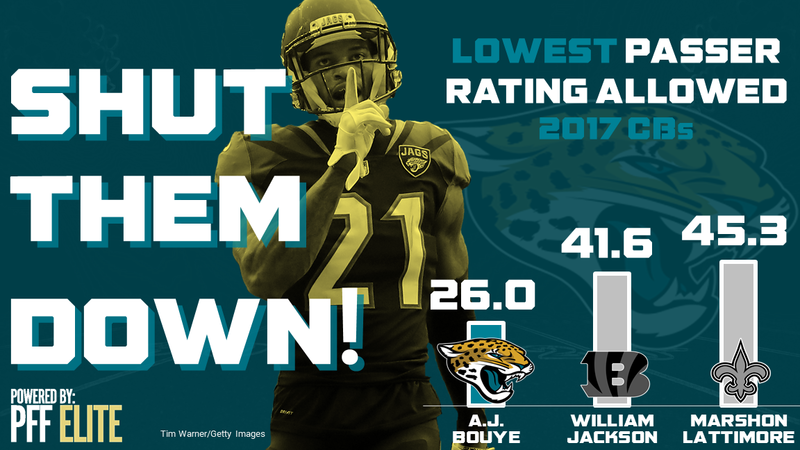 Bouye also has yet to allow a touchdown despite playing the most coverage snaps of any CB on this list (493). A 2016 first-round draft pick, PFF’s Sam Monson detailed why WJ III may be the best CB in his draft. 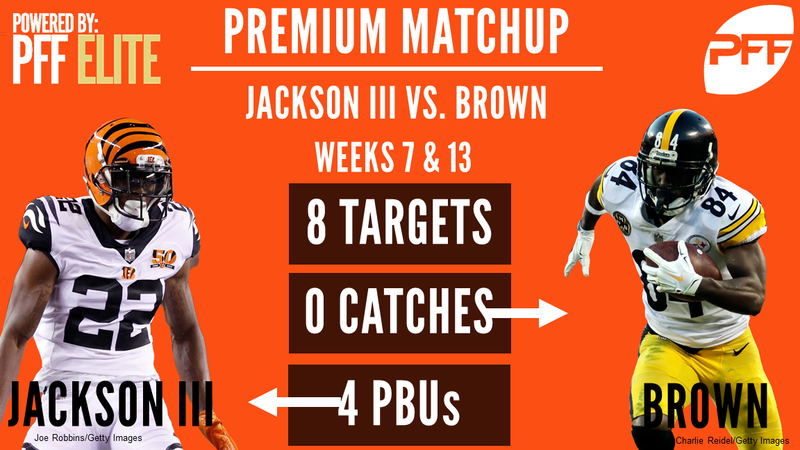 When given playing time this season, Jackson has been lockdown – especially against the likes of Antonio Brown, where he has yet to allow a catch on eight targets. Jackson might only have one pick to show for it, but his 40.5 catch rate into his coverage leads all corners and his yards allowed per cover snap ranks second (0.53). Lattimore has been part of a franchise-changing draft for the Saints in 2017. The 11th-overall pick has yet to give up a touchdown on 312 snaps spent in coverage. The only wide receiver to put up more than 38 yards against him this season is Julio Jones – a matchup in which Lattimore was able to pull down an interception. Before going down to injury, Smith was having the best season of his career. His top end play for Baltimore has been fantastic, but there have been some low points in his career thus far. This season, he hadn’t been targeted as much, ranking eight in cover snaps per target (8.5), however he still made plays when given his opportunities as he tied for ninth in playmaker index, bringing down three interceptions and five pass breakups this year. Improving every year since he left Green Bay, Hayward has had a career year and is the gold standard in coverage in 2017. He ranks first in coverage grade (97.2) and in turn is the highest graded cornerback overall in 2017. Just 42.2 percent of passes thrown his way have been caught. Hayward has been especially on a tear recently: in his last seven games he has more PDs/INTs (12) than catches allowed (10). Both Kendall and Kyle Fuller are having productive seasons, but it’s the Washington brother that has been more impressive. He ranks eighth in coverage grade (88.5) this season as Fuller’s work in limiting receivers has earned him such a high grade. He has not allowed more than 38 yards in a game this season and has allowed just one touchdown. He also has four interceptions, which ranks tied for third among cornerbacks. One of the league’s more polarizing figures, Ramsey has been as good as advertised. Since Week 13 of the 2016 season, there may not be a better cornerback in the NFL. This season alone, he has four interceptions (tied for third-most) and 10 pass breakups (tied for 10th). He consistently makes plays on the ball as the former-Florida State Seminole has allowed just one touchdown on 76 targets this season. 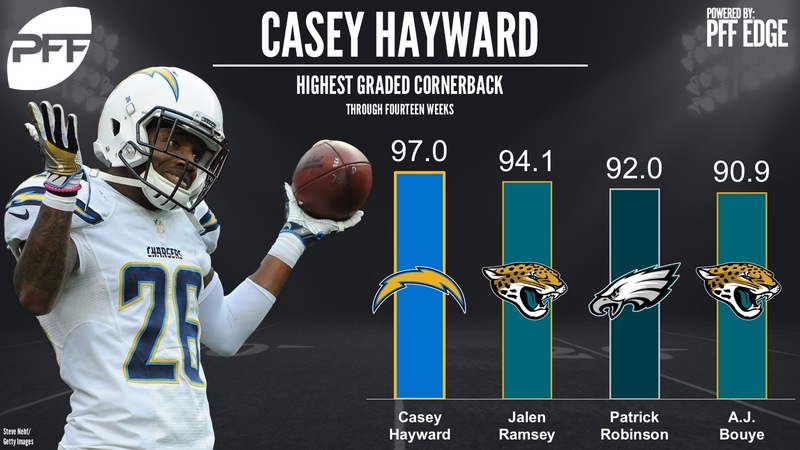 Ramsey ranks as PFF’s No. 2 overall CB with his 94.1 overall grade. Since replacing Justin Bethel in Week 6, Williams has found his best form since 2010. Only 50 percent of the passes thrown his way have been caught, which ranks 12th out of 119 cornerbacks, not bad for the 12-year veteran. Melvin has been a bright spot on a struggling Colts team this season before missing time with a hand injury. He ranks third on PFF’s ‘playmaker index,’ which measures plays on the ball (INTs + PDs), as he has disrupted passes thrown his way 23.6 percent of the time. ‘Big play Slay’ rounds out the top 10 with five interceptions and eight pass defenses. Quarterbacks have targeted the Slay 87 times in 2017, tied for the third-most in the NFL. No other cornerback on this list ranks in the top 10 of targets. Even more impressive with the high volume of targets, Slay ranks 12th in coverage grade among corners (87.0).